Properties in Sutton Hoo average 4.6 out of 5 stars. Property 1: Luxury Single Storey Wooden Clad Colonial Style Cottage In Countryside Setting. Cosy country cottage nr coast & forest. Woodstove. 5 min walk to village pub. Property 13: Cosy country cottage nr coast & forest. Woodstove. 5 min walk to village pub. Property 19: Charming, welcoming cottage in rural Suffolk close to the Orwell estuary. Delightful cottage. Sitting on a village green . Ideal location for Aldeburgh. Property 38: Delightful cottage. Sitting on a village green . Ideal location for Aldeburgh. Twosome, a beautiful, stylish, cosy cottage, perfect for two. 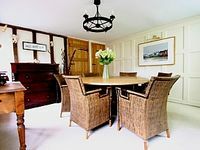 Property 47: Twosome, a beautiful, stylish, cosy cottage, perfect for two. We couldn't have selected a better home or location to see our family and friends. It was perfect.